Morrigan Crow born on an unlucky day. According to her family and the townspeople, she is cursed. She’s blamed for anything that goes wrong – from an old man’s heart attack to a burnt dinner. Worst of all, Morrigan, like all cursed children, will die at Midnight on Eventide. 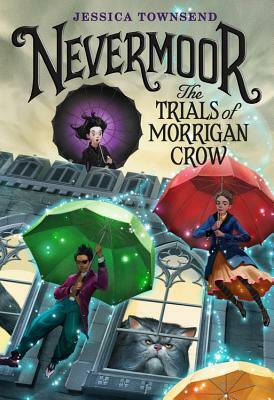 Morrigan is saved from death at the last moment by the unusual Jupiter North who takes her to the magical city, Nevermoor. This is a wonderful, imaginative story filled with magic, talking cats, black smoke hounds, hunters on horseback and the prestigious, Wundrous Society, which Morrigan hopes to join – or be sent home to face her fate. This is the first book in new series by debut Australian author Jessica Townsend. It’s a cracking read that will have readers’ hearts in their mouths. Morrigan is a terrific character, as is the scatty Jupiter. Perfect for readers aged 10 and over.